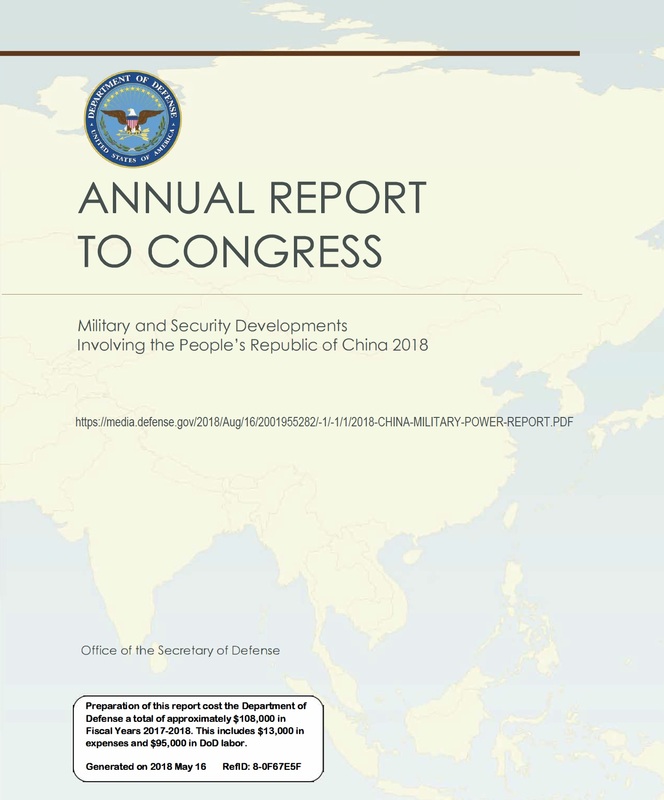 [Updated August 21, 2018] The Pentagon’s annual report to Congress on China’s military and security developments has finally been published, several months later than previous volumes. Normally it takes about one month after the report is generated to be published. This year it took three times that long. The report covers many aspects of Chinese military developments. In this article I’ll briefly review the nuclear weapons related aspects of the report. Overall, nuclear developments are not what stand out in this report. Although there are important nuclear developments, the Pentagon’s primary concern is clearly about China’s conventional forces. The DOD report repeats the conclusion from previous reports that China has not, despite writings by some PLA officers (and occasional speculations by outside analysts), changed its nuclear policy but retains a no-first-use (NFU) policy and a pledge not to use nuclear weapons against any non-nuclear weapon state or in nuclear-weapon-free zones. That would, strictly speaking, include Japan, even though it hosts large numbers of U.S. forces. The NFU policy, DOD says, has “contributed to the construction of [underground facilities] for the country’s nuclear forces, which plan to survive an initial nuclear strike.” Stimulants for the tunneling efforts were the 1991 Gulf War and 1999 Kosovo war, which made the Chinese realize how vulnerable their forces would be in a war with the United States. Nor does the report indicate China has yet mated nuclear warheads to its missiles or placed nuclear forces on alert under normal circumstances. The report repeats the assessment from last that “China is enhancing peacetime readiness levels for these nuclear forces to ensure responsiveness.” That responsiveness is thought to ensure the force can disperse and go on alert if necessary. The report mentions unidentified PLA writings expressing the value of a “launch on warning” nuclear posture, but it does not say China has adopted such a posture. A launch on warning posture would require high readiness of nuclear forces to be able to launch as soon as a warning of an incoming nuclear attack was received. China already has a “ready the forces on warning” posture that involves gradually raising the readiness level in response to growing tension in a crisis. In U.S. military terminology, “launch on warning” is a higher readiness level than “launch under attack” because it would involve being able to launch upon detection that an attack was imminent but before incoming missiles had been detected. “Launch under attack,” in contrast, would require the force to be able to launch before incoming warheads hit U.S. launchers. The DOD report says the PLA writings highlight the “launch on warning” posture would be consistent with China’s no-first-use policy, which would imply it is more compatible with a “launch under attack” posture. The growing inventory of ICBMs and SSBNs means that China has to improve nuclear command and control of these systems for them to be effective. It is unknown if Chinese SSBNs have yet sailed on a deterrent patrol (we assume not), much less with nuclear warheads onboard (we also assume not). But the growing and increasingly mobile ICBM force is carrying out extensive combat patrol exercises that place new demands on the nuclear command and control system. A unique feature of the Chinese missile force is the mixing of nuclear and conventional versions of the same missiles (DF-21 and DF-26 have both nuclear and conventional roles). For China, this is a means to provide the leadership with non-nuclear strike options without having to resort to nuclear use. For China’s potential adversaries, it is a dangerous and destabilizing practice that risks causing confusion about the character of missile attacks and potentially trigger mistaken nuclear escalation in a conflict. China has, like other nuclear-armed states, lowered the yield of its nuclear warheads as ballistic missiles became more accurate. The current warhead used on the DF-31/A ICBMs is thought to be ten times less powerful than the multi-megaton warhead developed for the DF-5. Moreover, as China seeks to ensure the survivability of its warheads against missile defense systems, it is likely to continue to try to reduce the weight and size of its warheads to maximize penetration aids on the missiles. The DOD report mentions a “defense industry publication has also discussed the development of a new low-yield nuclear weapon,” but does not provide any details about the publication or what it said. The classified version apparently has more details. The overall number of Chinese ICBM launchers reported by DOD has remained stable since 2011: 50-75. One type (DF-4) has reload capability, so the number of available missiles is a little higher: 75-100 missiles. That number has also remained stable for the past three years. Indeed, other than the arrival of the DF-26 IRBM force, the total Chinese rocket forces estimate is identical to that of presented in the 2017 report. This indicates that the DF-31A force is not continuing to increase, that the DF-31AG has not yet been operationally deployed (or is replacing older DF-31s on a one-for-one basis), and that the DF-41 is still in development more than 20 years after it was first listed in the annual DOD report. 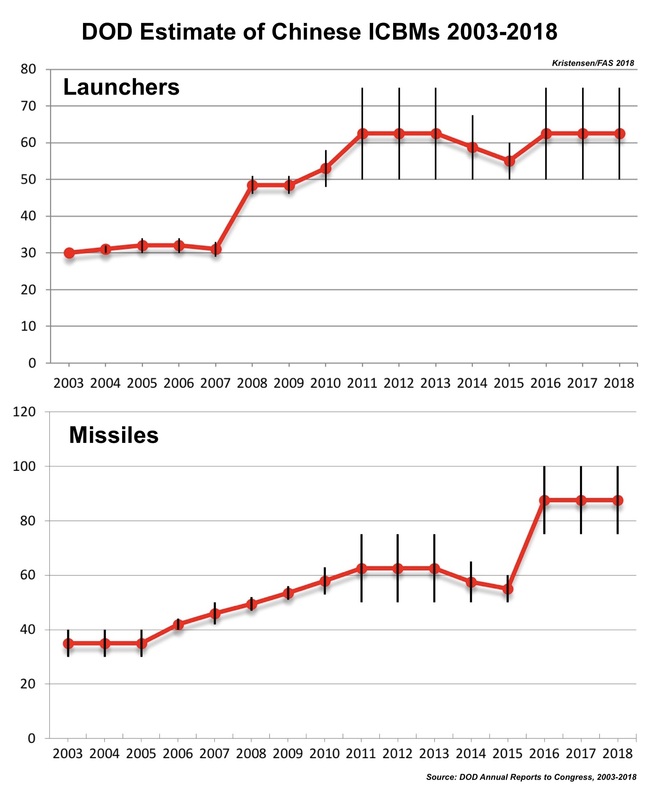 DOD’s reporting shows that the number of Chinese ICBM launchers has roughly doubled since 2003, while the number of missile available for those launchers has more than doubled. The numbers of missiles show a mysterious increase in 2016 from just over 40 to more than 80 (see table below). The increase is curious because it does not follow the number of launchers but suddenly jumps even though there was no corresponding increase in launchers that year. The DF-4 is thought to have reloads but that system has been deployed since the 1980s. There is considerable uncertainty in the number of launchers (some years 25). The increase coincides with the deployment of the MIRVed DF-5Bs, so a potential explanation might be that there are two full sets of DF-5 versions. But it should be underscored that it is unknown if this is the reason. The old liquid-fuel DF-4 (CSS-3) ICBM is still listed as operational, even though the relocatable missile will probably be replaced by more survivable road-mobile missiles in the near future. The DF-4 appears to be retained in a roll-out-to-launch posture. The old, but updated, liquid-fuel, silo-based DF-5 ICBM is still listed in two version: the single-warhead DF-5A and the MIRVed DF-5B. This missile was first deployed in the early-1980s and is based in 20 silos in the eastern part of central China. There is no mentioning of a rumored C version. The DF-31 and DF-31A are the most modern operational ICBMs in the Chinese inventory. First fielded in 2006 and 2007, respectively, deployment of the DF-31 appears to have stalled and DF-31A is operational in perhaps three brigades. Each missile can carry a single warhead. The DF-31AG is mentioned for the first time as an enhanced DF-31 with improved launcher maneuverability and survivability but may not yet be fully operational. The long-awaited DF-41 ICBM remains in development and is listed by DOD as MIRV-capable. The report states that China is “considering additional launch options” for the DF-41, including rail-mobile and silo-basing. In silo-based version it would likely replace the DF-5. The medium- and intermediate-range nuclear missile force is made up of three types: the new DF-26 IRBM, which is dual-capable and able to conduct conventional (both land-attack and anti-ship) and nuclear precision attacks; and two versions of the DF-21: DF-21A and DF-21E. The DF-21 A (SSC-5 Mod 2) has been deployed since the late-1990s. The DF-21E (note: the E designation is not official but assumed) is known as the SSC-5 Mod 6 and was first reported in 2016. The DF-21 also exists in two conventional versions: DF-21C and DF-21D (anti-ship). The dual-capable DF-26, first fielded in 2016, is capable of conducting “nuclear precision strikes against ground targets.” There appears to be one or two DF-26 brigades. The role of the new Strategic Support Force is listed as intended to “centralize the military’s space, cyber, and EW [Early Warning] missions. These would probably support the rocket force. The DOD report says that China still operates four Jin-class (Type 094) SSBNs (all based at Hainan), each of which can carry up to 12 JL-2 SLBMs. At least one more Jin-SSBN is said to be under construction. Construction of a new SSBN (Type 096) may begin in the mid-2020s with a new SLBM (JL-3). DOD speculates that Type 094 and Type 096 SSBNs might end up operating concurrently, which, if accurate, could increase the size of the total SSBN fleet. Overall, China operates 56 submarines, of which 47 are diesel-electric. The report projects this force may increase to 69-78 submarines by 2020, a significant increase in only two years. There is no mentioning in the DOD report of the nuclear sea-launched cruise missile listed in the Nuclear Posture Review fact sheet from February 2018. One of the most interesting nuclear developments in the DOD report is the assessment that “the PLAAF has newly been re-assigned a nuclear mission.” This contrasts with last year’s report, which stated the “PLAAF does not currently have a nuclear mission.” The “re-assignment” indicates that the bombers previous had a nuclear mission. We have estimated that a small number of bombers had a dormant nuclear capability for gravity bombs as indicated by their extensive role in the nuclear weapons testing program and China’s display of nuclear bombs in military museums. The DOD report states that the H-6 and the future stealth bomber could both be nuclear-capable. The future bomber, according to the DOD report, could potentially be operational within the next ten years. The report repeats the estimate made by the U.S. Intelligence Community from the past two years that China is upgrading its aircraft with two new air-launched ballistic missiles, one of which may include a nuclear payload. The DOD report does not mention the nuclear air-launched cruise missile listed the Nuclear Posture Review fact sheet from February 2018.